Lemon-lime soda, fresh squeezed lime juice and REAL cherry puree NOT artificial grenadine. Blended with your choice of All Natural syrup. Lemonade and blended strawberries over ice. Lemon-lime soda, fresh squeezed lime juice and blended strawberries. Made with fresh lime and lemon juice and real sugar. 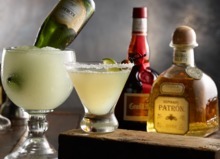 Gold Tequila, Orange Liqueur, Sweet-n-Sour with fresh lime juice. 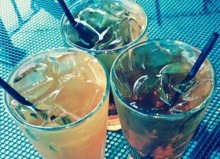 Served on the rocks. 54 Frozen Margarita partying it up with an upside down bottle of Corona. Served in a 25 oz. 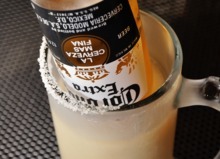 frosty mug. 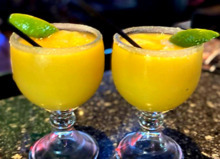 Cerveza + Margarita = Fiesta mas Grande! 54 Frozen Margarita with an upside down bottle of Korbel California Champagne. 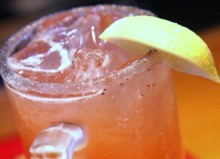 We will add Grand Marnier, fresh squeezed lime juice and pure cane syrup. 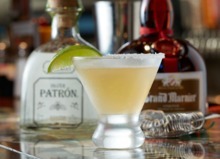 Patron 54 Signature Reposado, Patron Citronge Pineapple, organic honey infused syrup and fresh lime juice. 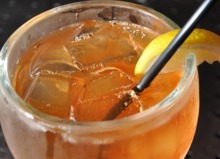 Bacardi Rum, Sobieski Polish Vodka, New Amsterdam Gin, Gold Tequila, Triple Sec, Sweet-n-Sour with fresh lime juice, Cola. Sugar Island Coconut Rum, Myers's Dark Rum, Crème de Banana, pineapple and orange juice. 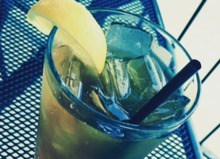 Bacardi Rum mixed with fresh basil muddled in freshly made in-house lemonade. S.D. 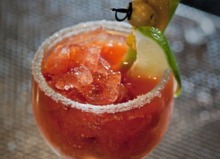 Strong Vodka (cave distilled in Parkville, MO) and simply the best Bloody Mary Juice on the planet. Bacardi Rum, fresh mint, fresh lime juice and soda water. 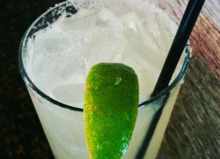 Sobieski Vodka, fresh lime juice and Gosling Ginger Beer. 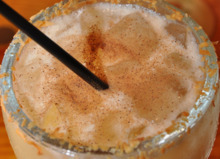 A heavy pour of Pusser's Rum with pineapple juice, orange juice, real coconut puree and grated nutmeg. A heavy pour of Light Rum, real coconut puree and pineapple juice, finished with a float of Myers's Dark Rum. 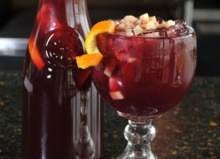 Red wine blended with brandy, fresh lime juice, pineapple juice, pure cane syrup and fresh fruit. Rebel Yell Small Batch Rye Whiskey, R & W Tart Cherry Liqueur, rosemary infused simple syrup and fresh lemon juice. Light Rum blended with strawberries, finished with a float of Myers's Dark Rum. Bacardi Rum, Sobieski Polish Vodka, New Amsterdam Gin, Gold Tequila, Triple Sec, Sweet-n-Sour with fresh lime juice, strawberries, Lemon-Lime Soda. Strawberry Vodka, strawberries and freshly made in-house lemonade. S.D. Strong Pillar 136 Gin, fresh lemon juice, pure cane sugar and soda water create a light and refreshing cocktail that has been around since the 1850's. 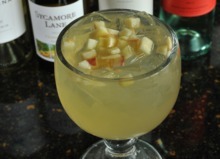 White wine blended with mango, peach and coconut flavors, fresh lemon juice and fresh fruit. Sobieski Vanilla, Frangelico, Godiva Chocolate Liqueur. 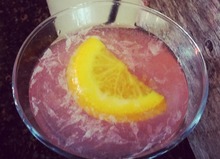 Sobieski Polish Vodka, Fleur Elderflower Liqueur, cranberry juice, fresh squeezed lime juice, pure cane syrup. Sugar Island Coconut Rum, Peach Schnapps, strawberries, pineapple juice. 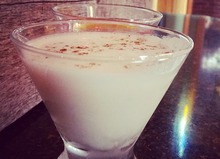 RumChata, Fireball Cinnamon Whiskey, Sugar Island Coconut Rum, pure cane syrup, cream. Draft and bottle selection vary by location. 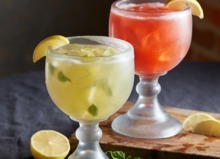 Click here to view the Beer Card at your favorite 54th Street.